Teacher’s Comments: A stellar example of “Up North” Michigan golf. True North, near Harbor Springs, Michigan is one of two Jim Engh designs in Michigan (the other is Tullymore). It is an interesting layout on a spectacular piece of property. 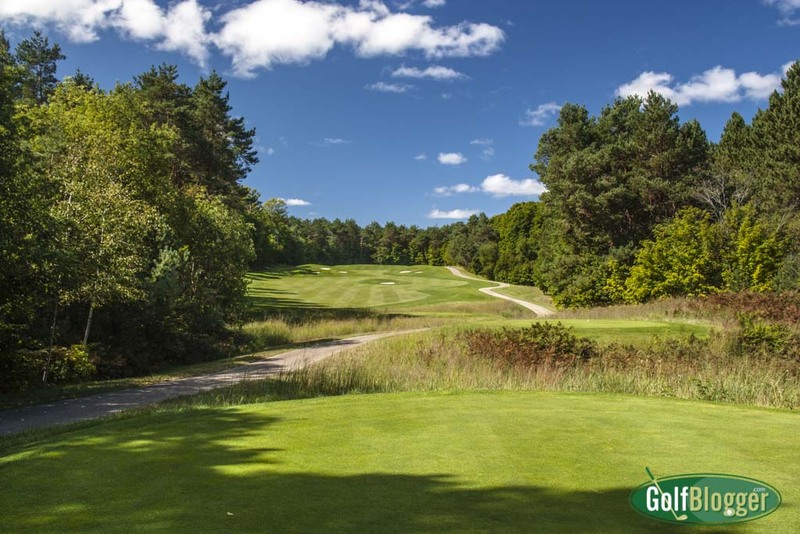 True North is a private course, but if you’re lucky, you may be able to get a tee time. I played on a fall Saturday when their regular traffic was slow (actually non-existent). All it took was a phone call. 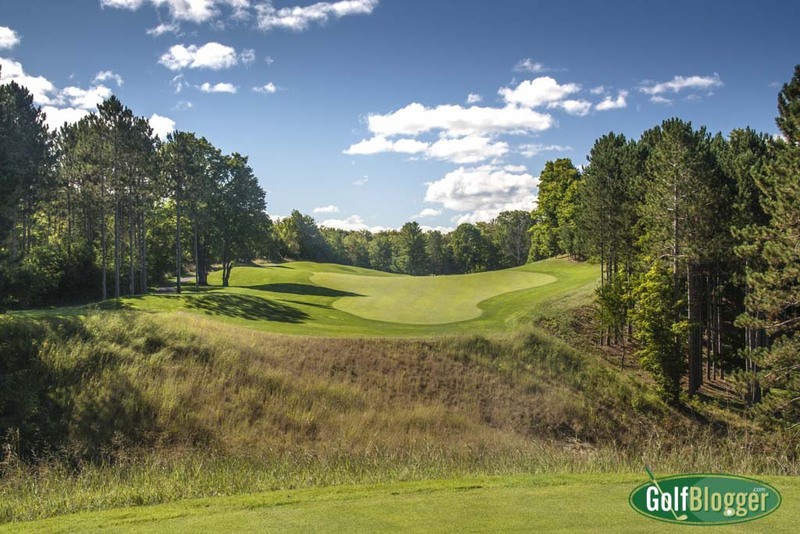 All of the hallmarks of “Up North” Michigan golf are present at True North: big elevation changes; wide, tree-lined fairways; and long stretches of splendid isolation. It is impossible for me to pick a favorite hole, for every one held my interest. If forced to choose, however, the par four fourth stands out. The fourth is an uphill shot, measuring 400 yards from the tips. At 257 yards out, a bunker in the middle of the fairway divides the landing area. Behind that bunker, the fairway narrows to a sliver, protected on both sides by mounds and bunkers. The fairway ends thirty yards before the elevated green. I like to think that this hole shows that Engh has a sense of humor as a designer. I found it humorous, at least. Of particular note at True North are the par threes. Elevation changes, terrain and Jim Engh’s imagination turned them into a significant departure from the ordinary. The third is a good example. Measuring 218 from the back tees, it has a narrow strip of fairway in front of the green, interrupted by three bunkers. To the right and rear, however, is another piece of fairway. I can’t recall seeing another par three with a chunk of fairway behind the hole. I think that’s Engh’s sense of humor showing again. The other par threes offer similarly unusual alignments. True North Hole 5 The fifth at True North is a 201 yard par 3. True North Hole 10 The tenth at True North is a 214 yard par three. True North Hole 16 The sixteenth at True North is a 177 yard par 3. On the basis of Tullymore and True North, I think I’m now a fan of Jim Engh’s designs. I’ll have to figure out how to get to some of his other courses to see how they match up with his Michigan creations. Conditions on the September day I played were terrific. True North is exactly what you would expect from a premium course. The True North Golf Course Review was first published January 13, 2016 from notes taken on a September 2015 visit. The second at True North is a 473 yard par 4. A look back uphill at True North's second. The fifth at True North is a 201 yard par 3. The sixth at True North is a 368 yard par 4. The seventh at True North is a 595 yard par 5. A view from the fairway on True North's seventh. A look back at True North's eighth. The ninth at True North is a 401 yard par 4. The tenth at True North is a 214 yard par three. The twelfth at True North is a 545 yard par five. The fifteenth at True North is a 320 yard par 4. From the fairway on the 15th at True North. The sixteenth at True North is a 177 yard par 3.